“…We are brought up in the ethic that others, any others, all others, are by definition more interesting than ourselves; taught to be different, just this side of self-effacing … Only the very young and the very old may recount their dreams at breakfast, dwell upon self, interrupt with memories of beach picnics and favorite Liberty lawn dresses and the rainbow trout in a creek near Colorado Springs. The rest of us are expected, rightly, to affect absorption in other people’s favorite dresses, other people’s trout. I read this essay in bed the other night then couldn’t fall asleep. It started to sound similar to what I struggle with in my part personal/part public writing—this feeling that I’m interrupting all the interesting people, all the ones who truly warrant my respect and unwavering attention. The idea that Everyone is more interesting than me is one that I’ve pounded into my own head, or at least tried to, silly as that may sound. But I often doubt my own commitment to the mantra. How can I believe that I’m inherently uninteresting but continue to write about myself—a subject that I shamefully devote so much energy to—without veering into a vomit-worthy public display of narcissism? That question has plagued me since I started this blog. Now, as I’ve begun blogging about my move to Spain, I’ve become exponentially more aware of how easy it is to meander from introspection into narcissism. A bit of background: I’ve always been a prolific journal-er, whether it was online or in a notebook, and I always kept those thoughts in a private place (yeah, you could call it a diary). But when I studied abroad last year, I decided to create a public blog. It’s a popular thing to do when you’re 20 years old and spending a semester in Europe… the kind of thing that would be #1 on a list of Stuff Expats Like. But my study abroad blog had its value. Writing to a perceived audience held me accountable for posting regularly. I like reading back now and recalling those experiences the way I felt them at the time, not the way I’ve distorted them in my memories. Of course, there was so much happening that semester that didn’t make the blog—so much that has been distorted in my memory because it was far too intimate to publish for a potential audience of friends and strangers. When I thought about all this—the benefits of the public blog and the absence of intimate details—I got cynical. Because really, what’s the point of a blog that’s just a Diary Lite? 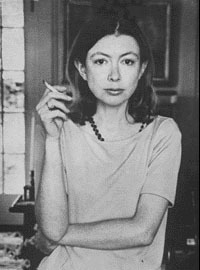 Although, if I did what Joan Didion says we’re raised to do, I would stay absorbed in other people’s proverbial trout 100 percent of the time. I wouldn’t even think about my own trout, much less blog about them. Didion’s only offense was keeping a private notebook. Mine is much worse—it’s this blog. It’s every blog I’ve ever had. It’s a public display of Me focusing on Me, and I publish it eagerly and frequently, hoping somebody might read it. And that someone might comment, if I’m being honest. It feels dirty no matter how I spin it, although I want badly to justify it, because I genuinely enjoy this kind of writing. I mean, Jesus—any dummy with a computer and an Internet connection can be a “published” writer (see: me). The blogosphere won’t collapse if I neglect to write something maudlin about that-time-I-made-a-super-big-life-decision-to-go-to-another-country. Seventy million other 20-somethings have already written it, just in different words, at MySuperBigLifeDecisionOmg.freeblogsite.com. But here I am, still hacking away at it. Every now and then I’m compelled to write about a subject that’s both personal and purposeful, something that might be relatable to a lot of people for a lot of reasons. I felt like I accomplished this in my Ke$ha piece. But I often don’t feel I accomplish much with my personal blog, other than keeping myself entertained. Maybe it’s an age and maturity thing. Maybe I’m still trapped in the mindset that my experiences are wholly singular and unique and that I can’t build a bridge between my life and public issues. Maybe I occasionally do build that bridge but I don’t realize it. I guess what I’m saying is, I’ve been struggling with this philosophical/ethical question that I don’t quite know how to articulate. Is anyone else feeling this way? Did I just build a bridge from my personal life into a common issue? Or am I certifiably insane? Probably both. And yes, it’s a tinge ironic that I wrote about how I wish I weren’t such a narcissist by talking about myself at length. Around 700 words worth of Me-talk, to be exact. Previous Post Previous post:Hello there. I think blogging is only a narcissistic waste of time if you’re A) a bad writer or B) not making broader points about your own experience. So, yeah, for most people, blogging is a vanity exercise (ahem, myself and Meghan McCain). But for you, blogging is worthwhile. I totally understand the “everyone else is more interesting than I am” ethos, which I internalized at a very young age. That theory is the basis of journalism, yes? Anyway, if you didn’t blog, and you’re significantly more interesting than I am, I have one fewer person’s experiences to learn about. Then I’m forced to read about people like Snooki, who are interesting for all the wrong reasons and lack depth. Oh please. If your blog is a vanity exercise, I should just quit now. What’s worse than a vanity exercise? I can’t even think of an example, which means it must be pretty bad. But thanks for pointing out something that I stupidly overlooked, RE: “everyone else is more interesting than I am” = ethos of a journalist. No wonder. Now I’m connecting the dots. Great reading. I often struggle with the apparent contradiction between my own insignificant, banal thoughts and the desire to write publically about them. One way I mask my own narcissism is by framing my experiences in self-effacing humor and hyperbole. It’s just more fun. I’ll sometimes create an alter-ego in stories who is obviously me. But this way, people tend to overlook how much time I’ve actually spent thinking about myself. I still don’t know what I’m doing, but I hope that someone will appreciate the effort (if not pay me a bunch of money). People seem to appreciate ideas that help them escape and/or those with which they can identify. And if it’s well-written, even better. 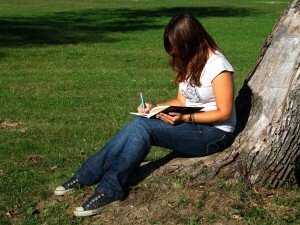 It is worthwhile to figure out why you write, if you figure it out let me know. As far as self-centered attitudes go, I gladly say I’d prefer to be with people that seem to be more intelligent (interesting) than me. With them, I have more opportunities to make fun of myself. Hey Shawn, thanks for the comment. I found this funny: “One way I mask my own narcissism is by framing my experiences in self-effacing humor and hyperbole.” I guess that’s a lot of what I do. Or at least, I hope that if I tell a story about myself in an engaging enough manner, someone will stop to read it. But that’s sort of the point of writing, right? If not THE point, I’m sure it’s one of them.